Now traveling with Molly O’Sullivan who trusts him implicitly and with Liv Chenka whom he must still convince given what she has seen in his future, the Doctor lands back on Earth in the 1970s to close out Dark Eyes 2 in Matt Fitton’s ‘Eyes of the Master.’ The timelines have shifted, however, and with Doctor Sally Armstrong alive again and working at the mysterious Ides Institute, Molly’s dark eyes soon prove to be at the centre of a plot to take over the universe. 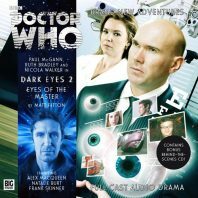 Following a brief vocal cameo at the end of the preceding tale, the title and cover make no secret of the fact that Alex Macqueen’s Master is the focal villain of this piece, allowing the character a triumphant return following a standout introduction in UNIT: Dominion that proved just how eerily alike and totally different the two Time Lords can be. Dark Eyes as a whole has been unafraid of at the very least referencing the Time War that would become so influential in the development of the man leading the modern iteration of the television series, and following the Doctor laughing off the prospect of an all-destructive war between the Daleks and Time Lords in the first set, the Master states that he is working for the Time Lords here for some means unknown precisely because of his lack of compunction regarding extreme measures and even genocide. It seems clear that the Master will continue to be integral to this ongoing saga as he uses an Eminence coffin to control its soldiers and as the Time War continues to draw near, and Macqueen is effortlessly able to exude the calm charisma that defined Roger Delgado’s suave incarnation while also bursting into more manic fits befitting of John Simm’s latter version to encapsulate the bridge of classic and modern that these ongoing Eighth Doctor adventures continue to represent. Given that Dark Eyes wasn’t necessarily intended to be a sprawling sixteen-story epic, the inclusion of the Ides Institute once again is a deft touch that further integrates these events, though here it exists on Harley Street since Kotris never existed due to the Daleks’ previous actions. This is the organisation that sent Randall after Liv in the preceding story, and the Master is committed to ensuring its place in history as he attempts to achieve the Time Lords’ goal of gaining control over the Eminence to avert the war they have foreseen if necessary. With the Doctor inadvertently reactivating Molly’s retrogenitor particles that seemingly work against the Eminence and thus completely alter the assumed rules of engagement, the importance of the her dark eyes still has plenty of room for development, and another surprising coda that puts Molly forcefully alongside the Master and Sally aptly sets the scene while altering the status quo for the next box set. Given that the saga is now only halfway done, those looking for a bombastic climax and resolution will be disappointed, but ‘Eyes of the Master’ incredibly successfully brings together events coursing through all seven previous stories while effortlessly weaving in further exposition needed to understand how everyone has come to be at this point. Though a bit more could have been made of the Master’s nefarious plan and his unique accumulation of eyes, Paul McGann and Alex Macqueen steal the spotlight in a story filled with superb performances, and the events portrayed here expertly show how the Doctor came to reach the point seen in ‘The Traitor’ while also hinting at the trajectory he will take to become the man who will ultimately sacrifice himself to become the warrior needed at the universe’s time of greatest need. This is a range already brimming with potential and is arguably one of the most ambitious and exciting that Big Finish has yet produced, and the capable hands helming every aspect of production seems assured of making it a genuine classic.